Sylvia Holt has been my son’s piano teacher for 1 1/2 years. He learns well from her as a teacher, specifically because of her positive and encouraging teaching style. Her careful selection of materials has provided the challenge needed to improve, while encouraging my son’s personal taste and style to shine. Thank you Sylvia! Marie has been taking piano lessons from Sylvia Holt for approximately 2 years. It has been a wonderful experience for all of us. Sylvia never fails to be patient, encouraging and thorough with lessons and I am always impressed with her students of all levels during piano recitals. 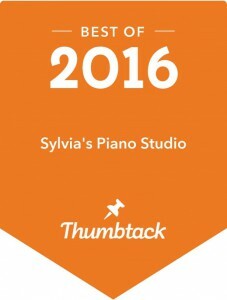 I would highly recommend Sylvia’s piano studio to anyone, and, in fact, I have! !